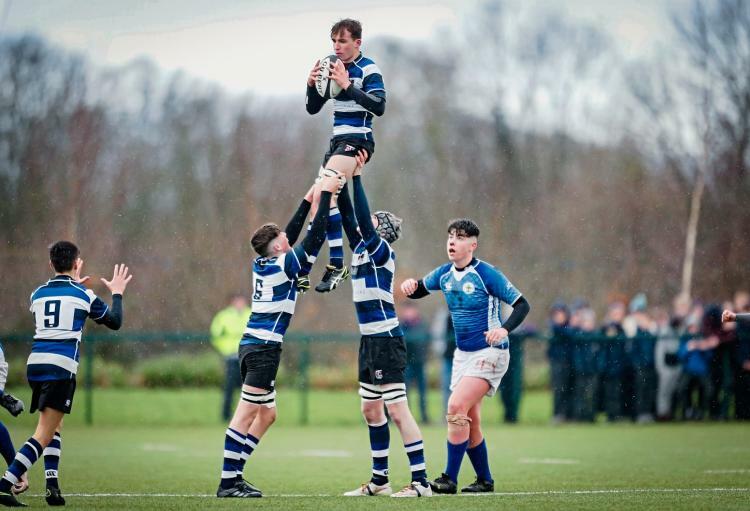 Crescent College Comprehensive and St Clements College got their respective Junior Cup seasons underway today at the University of Limerick as the Dooradoyle men edged out their rivals in a closely contested encounter. In horrid conditions, it was Clements that opened the scoring with a well worked try from back row Jamie Pearse in the 14th minute. The try was not converted and the score remained 5-0. The response came in the 28th minute when Crescent’s Dean O’Grady crashed over to put his side on the board, leaving the half time score at a balanced 5-5. Crescent struck first in what was an impressive second half display with centre Darragh Casserly slotting a penalty to edge his team in front. A steal at the struggling Clements lineout then left Comp banging on their opponents’ line and after a series of held up efforts and scrums, they eventually rumbled their way over for their second in the 48th minute. Another penalty came Crescent’s way in the 54th minute with Darragh Casserly earning his side another 3 points from the tee, and three minutes later Crescent were over the line again through Patrick Dolphin. To their credit, Clements responded in style in the closing minutes scoring their second try through Cian Casey. The out-half impressed with his footwork before touching down but ultimately it would prove little more than a consolation score with the game ending 21-10 in Crescent’s favour. Meanwhile in Cork, Castletroy’s Juniors put in a Trojan effort to overcome a strong PBC outfit on their home turf. The Limerick side came from behind to win 19-17 and book their place in the quarter finals.